Samford University honored outstanding student leaders at the school’s 2016 leadership and service awards convocation in late April. Laura Ann Prickett received the James M. Sizemore Award as the student in the senior class who has best demonstrated character, personality, scholarship and unselfish serve to the university. A political science and English major from Decatur, Alabama, she served as 2015–16 president of the Samford Student Government Association. Zachary Pittman received the John R. Mott Award as the man in the graduating class who represents high character, scholarship and student public service. He is a business major from Douglasville, Georgia. Margie Terp received the Gail Hyle Memorial Award as the woman in the graduating class who best exemplifies outstanding qualities of Christian character, leadership, school spirit and service. She is a journalism and mass communication major from Temple Terrace, Florida. Laura Bean received the Service Award, given to the student in the graduating class who best exemplifies the qualities of social service. She is a business major and Brock Scholar from Murfreesboro, Tennessee. Franklin Lowe and Emily Smothermon were named winners of the Rufus W. Shelton Community Service Award. The honor goes to one male and one female student who have done the most for betterment of life at Samford. Lowe, a senior history major from Fayetteville, Georgia, also won the Omicron Delta Kappa Circle Leader of the Year Award for exemplary service to the circle and to the Samford community. Smothermon is a senior communication studies major from Carmel, Indiana. Nathan Graham and Farrah Karimi received the Luke 2:52 Awards given annually to two undergraduate students who excel in all areas of student life: civic, social, spiritual and physical. Graham is a senior history major from Wetumpka, Alabama. Karimi is a senior religion major from Vestavia Hills, Alabama. Emily London and J. D. Tyler received Omicron Delta Kappa Freshman Leadership Awards as the male and female students who showed exemplary character, leadership, service and scholarship during their first year at Samford. London is an English major. Tyler is a religion major. Many other students were recognized for leadership in a variety of academic, service and student government posts. 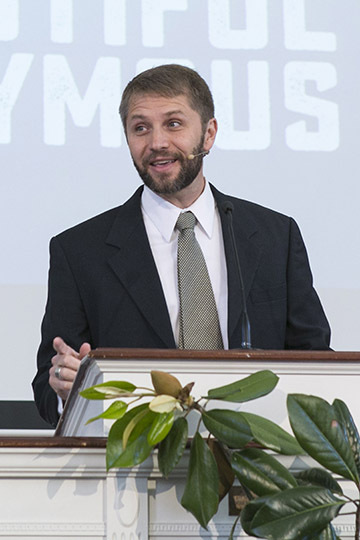 Brian Pitts, Samford’s minister to students for spiritual formation, was the guest speaker.